When we talk about the struggle for democracy in Myanmar, what might come to mind first is the plight of political activists who died or grew gravely ill behind bars. A lot has been written about the sacrifices they have made. But few would think of the struggles of the women who supported those men along the way. Daw Cho Cho is one of these women. 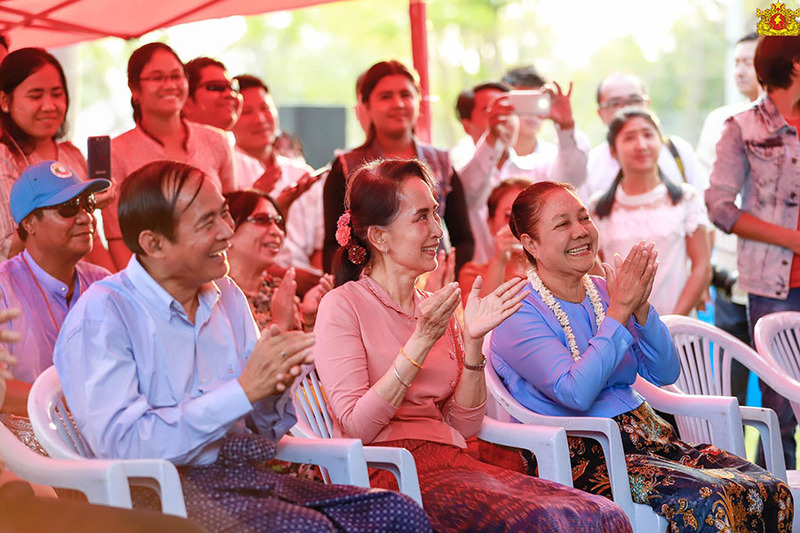 She has given unconditional support to her husband, the newly elected President U Win Myint, ever since the pro-democracy uprising in August 1988. Both of them were born and raised in Danubyu, a township in Irrawaddy Region. Daw Cho Cho was born to a well-off family, while U Win Myint was born to a farmer’s family. The two went to the same school and became classmates and childhood friends. Daw Cho Cho finished her schooling at matriculation, but her husband-to-be went to Yangon University and graduated in geology and law. He became a lawyer in 1985. Daw Cho Cho’s parents accepted U Win Myint as their son-in-law due to his honesty and industry. The two tied the knot, had two children, and their life together in Danubyu was going along smoothly until U Win Myint threw himself into the pro-democracy uprising in 1988. U Win Myint was imprisoned for his political activities during the uprising and after his release, he contested the 1990 general elections representing the National League for Democracy (NLD). “U Win Myint had to compete with Major-General Hla Oo from the National Unity Party in Danubyu,” said U San Htwe, a Danubyu Township lawmaker in Irrawaddy regional parliament. The National Unity Party is the reincarnation of the Burma Socialist Program Party, which was led by military dictator Gen Ne Win. “He faced a lot of difficulties. But Daw Cho Cho willingly let her husband engage in politics. She gave a lot of support. She cooked for the campaign team and folded campaign pamphlets,” added U San Htwe. U Win Myint won 56 percent of the votes and Daw Cho Cho was quite happy, but her happiness did not last long. The military regime of the State Law and Order Restoration Council (SLORC) rejected the 1990 election results, imprisoned many elected lawmakers and destroyed their livelihoods. “U Win Myint continued working as a lawyer in Danubyu after the election. But, no one hired him for fear of the authorities. So, they had no income,” said U San Htwe, who also worked as his campaign manager in the 1990 election in Danubyu. The SLORC government convened the National Convention in Yangon in 1993 to draft a new Constitution, which was approved in a national referendum in 2008. U Win Myint, as a NLD lawmaker, moved together with his family to Yangon to attend the National Convention. The military regime kept him and his family under constant surveillance, and not only in Yangon. “Whenever U Win Myint visited his mother and sisters in Pathein [in Irrawaddy Region], the military intelligence kept an eye on them. They tailed Ma Cho [Daw Cho Cho] whenever she went to the market or anywhere outside, and they watched who she met,” said Daw Hla Hla Htay, a former neighbor of U Win Myint’s in Pathein. Back in Yangon, U Win Myint had to move from one house to another because authorities put pressure on the homeowners. They finally settled after they sold their house in Danubyu and managed to buy an apartment in Tamwe Township. While U Win Myint was being detained for the second time by military intelligence, their only son Than Win Htike died of typhoid at the age of 16. Daw Cho Cho was overcome with grief as her husband was under detention and her only son died. She had to organize the funeral on her own and U Win Myint was only allowed to attend the Buddhist ritual at their home seven days after the death of his son. “Daw Cho Cho was the perfect wife for a politician. She supported her husband’s political aspirations all the way with courage,” said Lower House lawmaker Daw Khin San Hlaing of Pale Township. Without a job or income after the release of U Win Myint, Daw Cho Cho had to sell her jewelry to support the family and provide schooling for their daughter Phyu Phyu Thin. Phyu Phyu Thin graduated and got a job at a company. But troubles never end. “Authorities forced her employers to sack her time and again. So, she later dared not to take the bus straight to her work,” said Lower House lawmaker U Wai Hlaing Tun of Pathein Township. She had to change a number of buses to get to her work so that military intelligence would lose sight of her and not find out where she was working, he said. “She could not bear it long and later went to Singapore to work, sending money back to her parents,” he added. U Win Myint served at the NLD Headquarters in Yangon and contested the 2012 by-election from Pathein. Daw Cho Cho followed her husband along the campaign trail, even in the Bay of Bengal amid stormy weather. “We went to Baw Mi village from Thabaw Kan village for the by-election campaign. Everyone was afraid when stormy seas arose. We could finally exhale after we got to the embankment. Daw Cho Cho followed her husband on such trips,” U Wai Hlaing Tun recounted of his experiences on the campaign trail. U Win Myint won the by-election and moved to the municipal guesthouse in the administrative capital Naypyitaw. Daw Cho Cho followed her husband. “Some of the lawmakers neighboring U Win Myint were single. They didn’t bother to cook and Daw Cho Cho also cooked for them. They love her. She is so good-natured, and never stingy,” said lawmaker Daw Khin San Hlaing. Daw Cho Cho is therefore known as Mother Cho among younger NLD members. U Win Myint also won the 2015 election and became the speaker of the Lower House. “After U Win Myint became the Lower House lawmaker, he came and visited with Mother Cho in Pathein in 2017. 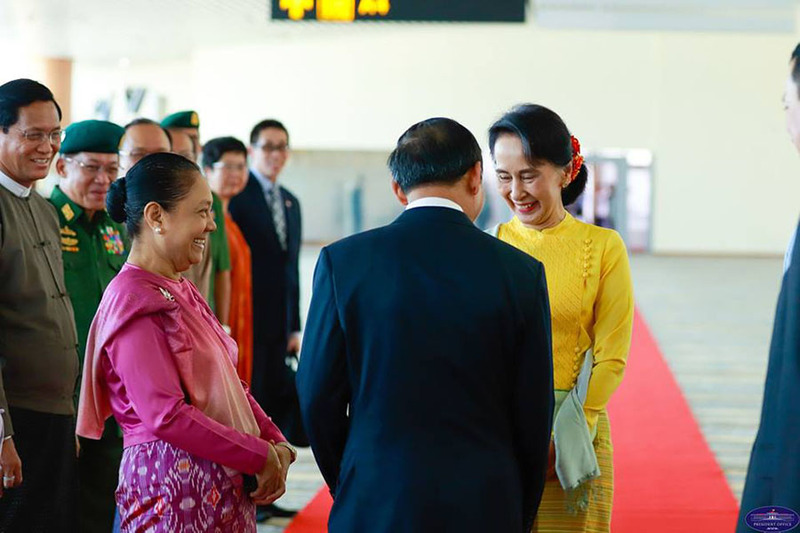 Both he and Mother Cho cordially greeted us as they did before,” said NLD member Ko Aung Min Htike. “Some of the people in the ward would not greet them because of their superior status. But then, they told them to treat them as usual,” he said. U Win Myint was elected the tenth president of Myanmar on March 28, 2018, to succeed U Htin Kyaw. “We are very glad and very proud to see them as the president and the first lady. Especially, I am glad for Ma Cho who endured years of trouble to support her husband. I think it is the return from their goodwill to the country,” said Daw Hla Hla Htay, one of their neighbors in Pathein.